More than a discovery, an experience to live! Board the comfortable sailing boat Dénébola with your professional skipper to discover the Ilets du Robert. The navigation is sailing and if you wish, you can maneuver! 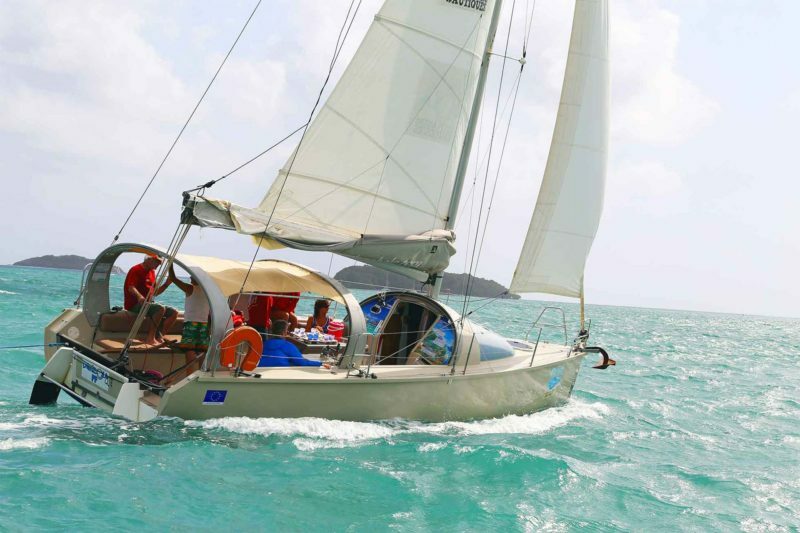 A day of nautical eco-tourism to discover the marine ecosystems of Martinique. Rendez-vous on the small beach of Pointe Fort at the caravan Dénébola. After a reminder of eco-actions your captain takes you by boat to the yacht. At 9.00, embarcation, safety instructions, we hoist the mainsail and cast off! How pleasant it is to sail pushed by the wind and comfortably seated in the spacious cockpit of Dénébola. The boat is ideal for trying out sailing in complete safety. You are at the helm, watched carefully by the skipper. Ready about !! The boat lists a little, as is normal for a single hull. Although the bay can be breezy, it is protected from the swell, and we will tack to go towards Islet Madame. A friendly lunch in the shade of verandas ,on tables arranged on Islet Madame. We have an apéritif with a view over the turquoise waters of the fonds blancs. You can choose between fruit juice, a home-made Planteur punch, a ti-punch, coco punch or coffee. You can picnic or have the meal and drinks (to order when reserving). Fully inclusive formula 100% local with produce from AN GRIYAV’LA farm. For the aperitif try vegetarian accras with drinks of your choice as shown above. 1et course: crudities are a speciality of Martinique, especially cucumber and smoked herring. Main course (hot) : Gratin de légumes pays (local vegetables cooked with breadcrumbs and grated cheese),rice, browned chicken marinated in old rum. We cross the bay under sail to anchor at Islet Chancel where live the friendly iguanas peculiar to the Lesser West Indies. We discover the ruins of an ancient pottery and a lime kiln dating from the late 17th century. Islet Chancel has a very special vegetation which seems to « whisper » the history of Martinique when the sugar-refining activity flourished. We wind up the anchor, set the sails and return calmly running before the wind. Early evening colors illuminate the Islet à Eau, Isletaux Rats, and Islet Petite Martinique. While sailing we have a snack. The more curious among us can consult the information brochures on marine life, corals, sponges, fish, illustrated with beautiful photos. – Chatrou (see explanation leaflet on 80 examples of marine life around Martinique. If you do not bring your picnic Dénébola offers a 100% local menu: vegetarian acras and raw vegetables. The hot dish: Country vegetable gratin, rice and scorched chicken marinated in old rum. Drinks: homemade juice, homemade planter, ti-punch, coconut or coffee punch, beers, still and sparkling water. For dessert: the fruits of the garden. The taste: shortbread vanilla or cinnamon. Are you a vegetarian? We can customize the menu for you. Tell us if you eat fish or eggs. Rent a stand up paddle and discover this new sensation of standing on the water. It is an activity accessible to all who can swim, it requires just a little balance. Equipped with fins; mask and snorkel you disembark by the quarterdeck and leave to explore the seabed. Your skipper will show you the way so that you will not miss anything, and will show you the different brochures on the marine life you will encounter. First you will discover the herbarium—the undersea prairies scattered with starfish, sea cucumbers and sea-urchins. If you are at ease in the water you can swim out to the coral reef—-patate de corail—-near to the islet. Although small it is home to a rich variety of fish, as well as corals, gorgons, sponges and anemones. You can come with your own kit or rent the exploration kit. Rent a stand up paddle and discover this new sensation of standing on the water. It is a very fun activity that will delight young and old. You will have an unobstructed view of the landscape: do not deprive yourself! You can wander over the white backgrounds of Ilet Madame or along the mangrove Ilet Chancel. It is an activity accessible to all who can swim, it requires just a little balance. See you at 08:30 at the small beach just after the Yacht Club Felix Merine, Pointe Fort / Lynch, common Robert. Locate the meeting point . Bring bath towel, sunglasses, sunscreen, cap, swimsuit, lycra, windbreaker and flip flops, camera. Also bring your fins, mask and snorkel if you have some. – The age of the children (for the size of the vests). – A phone number on which we can reach you. On the RN1 direction Robert / Trinité, 1st exit at the roundabout of the shopping center GEANT Casino. At the Giant roundabout, take straight ahead. Next roundabout take the second exit. At the Robert 3 school roundabout, straight ahead, next roundabout straight, after Proxi store 1st on the right, along the seaside; at the gendarmerie on the left, next roundabout 2nd exit then next roundabout 1st exit. You pass between a school and a pharmacy. Next roundabout, take the second exit. You leave a football field and basketball court on your right. Next intersection take straight ahead. Continue straight to the end of the path. At the last descent, you will have the yacht club on your right. Join us in front of the caravan Denebola near the small beach. If you come from the south, avoid Ducos and Lamentin and go through Petit Bourg then direction François to join the D1 which leads you to Robert. Remember to test your mask and snorkel before getting away from the boat (this will give you time to change if necessary). The mask strap should not be too tight and should fit in the middle of the back of the skull. Remember to check that no hair is trapped in the mask for a better seal. In order to avoid fogging in the mask you can apply toothpaste or spit in the mask. If your snorkel fills with water you can either remove it from the mouth to empty it or blow very hard to evacuate the water. The fins are used to advance faster without getting tired. It is therefore important to make the proper movement. To feel good, you have to lie down on the water and put yourself in tiptoe (as in classical dance). Then it’s a chisel movement that starts from the hip. A loose movement and not too fast not to run out of steam. (Avoid bending your knees too much, do not be too stiff either …) remember to sink your fins in the water so they are propellant and do not hit the surface of the water. There is no right foot or left foot. To make sure the fins are the right size, put your foot on the ground and lift only the heel. If the palm stays with your foot: it’s good! When you are above the coral reef, remember to lie down. If one stands up the fins go to the bottom and may damage the coral and gorgonians who are very fragile. Build on your signal float to stabilize your surface and explore without having to swim. (It’s also a lot more relaxing) Avoid touching animals (especially lion fish and stone fish) and moving rocks. Avoid solar oil that is harmful to coral. Do not try to feed the animals. For your safety we impose the use of a signal float. It is imperative to know how to swim. When you move outside the swimming area, be very attentive to the boats that can come dock on the pontoon. For those who practice stand up paddling for the first time it is best to start on their knees. It is important to center your weight in the middle of the board. Once you feel ready you can stand up. It is possible to help the paddle to straighten up. (Lay the paddle on the stand up and hoist it with). Once you have a little speed you gain stability. For your safety, wearing the vest is mandatory. Avoid moving in shallow areas or near boats. Indeed, if we are destabilized we must be able to dive into the water. For beginners do not practice on a windy area or with waves. Stay on a sheltered area of ​​the wind. If you can not get up, return to a kneeling position. If you can not reach the boat, sit on the board and make big signs. We will pick you up with the annex. Dénébola is the only Kaïdoz 31 on Martinique. It’s a modern yacht giving the sensation of smooth speed, with a fine-touch helm, a design worthy of a racing yacht, and comfort because of her big shady cockpit and cushioned seating. For any additional questions or requests, you can contact us by phone at+596 696 17 07 00 or by email. For a unique adventure with friends or family! Dénébola invites you to discover the coastline of Martinique and all its biodiversity during our sailing cruises in small groups. A discovery of the Nautical Pleasures in complete safety with a professional pedagogical team. Shipyard: Kaidoz Plaisance: Brittany, France 2006. Sailing yacht length 9.5m,capable of comfortably carrying 10 passengers. Designed by urban architect Jean-Louis Berthomieu and stylist Emmanuelle Beauchard, with a hull signed Faroux. Built using an « infusion » technique resin becomes very dense while at the same time eliminating all excess. 2007 Special jury prize , Voile Magazine. 2011 La Cité de la Voie Eric Tabarly buys two Kaïdoz 31 because of its sportif and family-friendly qualities.